St Peter is a landmark church on the north side of Stoke Bridge, overlooking a busy junction. When the church was built, the river was wider, and this must have been a waterside church. It is the first of a line of three medieval dockside churches about 200m each apart. Its fine west tower makes it seem much bigger than it actually is, and the great view when approaching from the south or west is a modern, unfamiliar one; until forty years ago, this church was surrounded by urban clutter. St Peter's tower has not been seen from a distance like this for hundreds of years, and perhaps never, because this has always been an urban, industrial parish. Indeed, because this is the oldest part of Ipswich, and Ipswich is England's longest continually occupied town, this is perhaps England's longest continually occupied urban parish. Views from the east, however, are dismal and more typical. 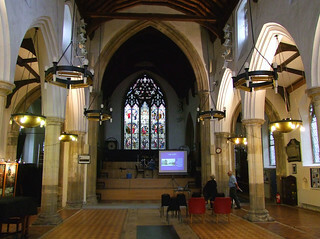 After this church was declared redundant in the early 1970s, it fell into a terrible state, at the time the most pitiful of all Ipswich churches. When St Peter was made redundant this was a far less busy area, and it was easy for vandals to break in and cause damage. This church was important enough for George Gilbert Scott to have been responsible for the considerable 1870s restoration of the nave and chancel, adding the rather alarming transepts, but this Victorian work seemed to be nearing the end of its structural life. The land here is very soft, and although St Peter doesn't suffer the problems that caused the closure of adjacent St Mary at Quay, there were cracks in the nave walls that had to be urgently addressed. 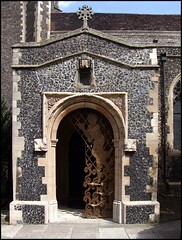 As at St Stephen and St Lawrence, the main entrance is from the west, and there are elaborate niches flanking the doorway. This view has benefited greatly from the late 1990s restoration, of which more in a moment. To the east, the factory has been demolished, and this whole area is now part of Ipswich's biggest regeneration programme since the 1960s, the Waterside development. Now, St Peter's neighbours include an apartment block which is twenty five storeys high, the tallest building in East Anglia. The dockside silos and factories are being replaced by designer flats, bars and hotels. The wet dock itself is now a large marina. One day, this may well be a wonderful setting for the church. For the last fifteen years, however, it has been a building site. Coming here in 2006 was a slightly distressing experience. Inside, the damage caused by vandalism, settlement and weather were readily apparent. 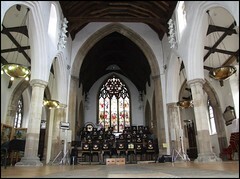 The east window was still partly boarded up (at one time, they all were) and the paint had peeled from the walls. Virtually all the fixtures had gone, and so there was a poignancy about the way the altar and pulpit were dressed. But when I had first seen it, in the early 1990s, it had been much worse than this. 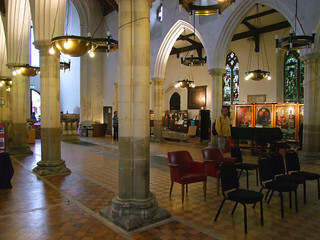 The Ipswich Historic Churches Trust, which took over the care of St Peter, allowed it to be used by a model railway club for nearly 20 years. The nave was tightly packed with model train layouts, the arcades draped with electric cables, making a proper appreciation of the integrity of the interior impossible. This church was terribly uncared for, and it all seemed a shame. This church was only open on the Historic Churches bike ride day, (unless, of course, you joined the model railway club), but a visit was always desirable, because St Peter has one great treasure. 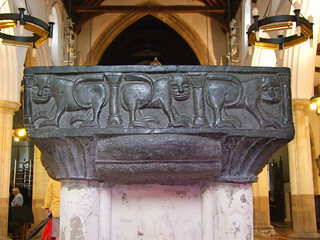 It has the finest black Tournai marble font in England. 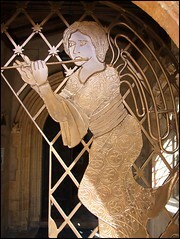 There are only 9 others, including St Peter's near-twin in Lincoln Cathedral. It is a mystery why the Anglican diocese allowed this to remain in such a vulnerable building when so much else - organ, benches, fittings - had been removed. 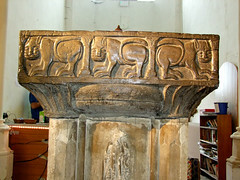 When a church falls redundant, the font is often the first thing to go, pressed into service at some other church. But here, the massive black square block remained, brooding, with its primitive carvings of lions. 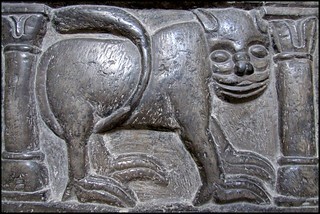 Once seen, this 12th century art treasure is never forgotten. And yet, for 364 days a year, the town's most important early-medieval artifact was locked away with the train-sets and the damp. Few decisions could have been more short-sighted. But it survived, of course, and has no doubt survived much worse over the centuries, and sits just to the east of the soaring tower arch. St Peter's other treasure is the so-called 'Wolsey's gateway', a watergate which is all that remains of the school planned by Cardinal Wolsey as a feeder to his Oxford college.The school was never completed, its stone taken for use elsewhere in the town. The gateway itself, built into St Peter's south churchyard wall, is of mild interest, I suppose, its crest and brickwork eaten away by acidic fumes from the thousands of cars that pass within a few feet everyday. I don't suppose the Victorian factory fumes did it much good either. 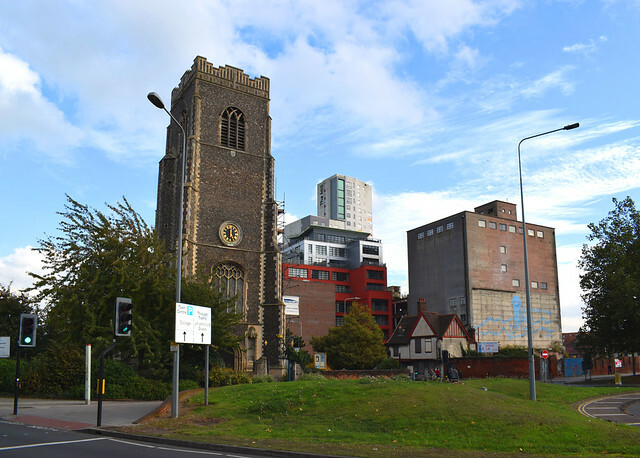 The five medieval churches of Ipswich town centre which were declared redundant in the 1970s and 1980s were handed to the Borough Council, who established the Ipswich Historic Churches Trust to look after them. 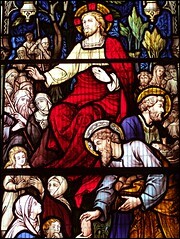 It was something of a poisoned chalice for those who became the churches' stewards, for there was little money available to be spent on them. Indeed, it sometimes appeared as if the financial problem was deliberately intended as a spur for the Trust to find fully commercial uses for the buildings. 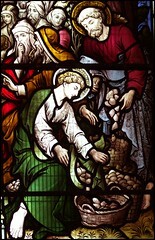 In 1999, there was a chance of a business use for St Peter. Acorn Office Supplies, an established office equipment firm out on one of the industrial estates, were looking for a town centre showroom. The model railway club were sent packing, and the building was given an extensive (and essential) programme of restoration, revealing superb exterior flintwork, as bubbly as lace. Planning permission was obtained to convert St Peter into offices and a showroom for Acorn. 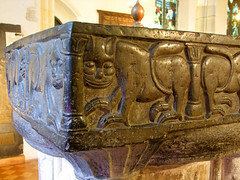 The firm was full of promises about allowing access to the font, which would have been a great thing for the town. Unfortunately, when John Blatchly of the Ipswich Historic Churches Trust wrote to me in November 2001 it was to say that Acorn Office Equipment had withdrawn. This is a great disappointment to us, he wrote, for the public were to have had access to much of the building during office hours, there would have been no permanent changes to the fabric of the building, and significant improvements would have been made to the buildings facilities and decorative state. The irony is, of course, that St Peter and its fellow docklands churches were once at the heart of one of the great commercial powerhouses of late medieval and early modern England. 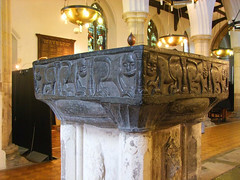 A few details survive to remind us of this, including a ledger stone immediately to the east of the font which remembers a Dutch merchant resident in Ipswich, Adriaen Wayvel. 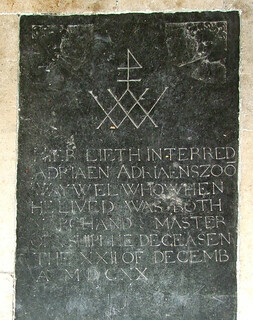 The inscription reads hier lieth interred Adriaen Adriaenszoon Waywel who when he lived was both Marchand & Master of Shipp He deceasen the XXII of Decemb A MDCXX. 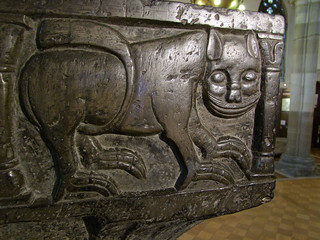 Rather than the more familiar heraldic device, the inscription is surmounted by Wayvel's merchant mark. There is no doubt that new money counted for far more than old money in this part of Suffolk at least, and looking outside it is clear that this is still the case. Ad yet, there had never been a satisfactory commercial reuse of a medieval church in Ipswich, and it wasn't going to happen this time. Indeed, there never would be. Chastened perhaps by the possible ultimate cost of the conversion, Acorn remained on their industrial estate. And, of course, they were correct to do so, because nowadays who in their right mind would go into a town centre to look at office furniture, when there is a perfectly good supplier on the edge of town? And therein lies the problem. As planning laws have loosened, and buildings can be constructed swiftly with cheaper materials, no commercial organisation in its right mind was going to spend the seven figure sum required to bring a redundant medieval building up to standard. The early years of the new millennium really were dark days for the redundant town centre churches, because it really looked as if a quarter of a century's neglect might lead to their ultimate demise. When I wrote about this church in 2006, I asked a simple question. What should happen to St Peter? 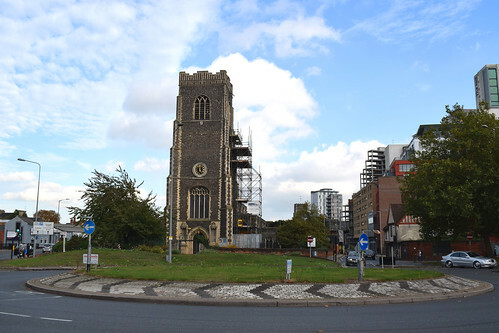 In this redevelopment area, everything was up for grabs; a borough that can give planning permission for a twenty-five storey block beside a medieval church is presumably capable of doing more or less anything to the church itself. 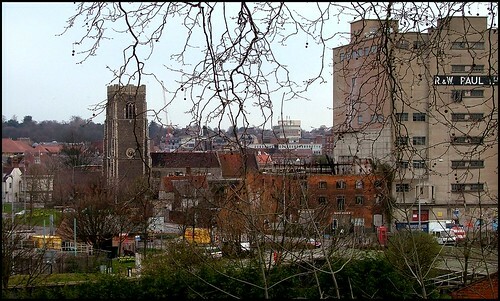 St Peter's tower has become a landmark, an essential part of the townscape, and the font is a national treasure. I suggested then that perhaps the best way forward was to primarily consider the conservation of these two features, perhaps by demolishing the rest of the structure, which is largely Victorian, and turning it into a garden, perhaps entered through Wolsey's gateway. 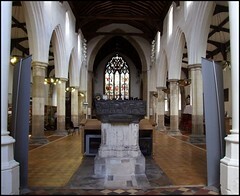 The font could then be enclosed beneath the tower by a glass atrium to east of the elegant tower arch. This may have sounded radical, but this is an area where radical ideas were being enthusiastically implemented, and was in any case no more radical than the Brooke Report of the 1960s, which advised that redundant medieval churches should be demolished and the land sold. Of course, my suggestion was slightly tongue-in-cheek, although I hoped it might have a galvanising effect. St Peter seemed to have no one to care for it, and no one had really loved it since it had been declared redundant some forty years ago. But there are many differences between the Britain of forty years ago and the Britain of today. Primarily, of course, we are now a rich country, and can afford the luxury of maintaining our priceless heritage more than we could then - unless we plan to cash in the family silver and spend the proceeds on the bombing of Middle Eastern countries, of course. Secondly, a vast heritage industry has grown up in that time; people are now obsessed with the past, and historically themed villages and electronically enhanced 'experiences' cater for their hunger. There's nothing we like so much these days as a wander through a Viking town, or watching a medieval cobbler at work, or various troops of the Civil War beating seven shades out of each other. Thirdly, there is a hunger for a sense of the numinous; people are searching for something that they didn't seem to want forty years ago. Sometimes this is satisfied by New Age mysticism, but the Churches still have a lot to offer - the Church of England seems to have at last begun to grasp that most people don't want to attend Sunday services, but they may still want to wander into a church and look around, and to sit and to think for a while. People go into a church when they want to pray or if they only want a good cry. They won't necessarily come back on Sunday - although, of course, they might - but the church building itself offers them a spiritual shelter, at least if it is open during the day, which most working churches in Ipswich town centre are. Fourthly, there is a huge passion in North America and Australia for tracing ancestral roots. 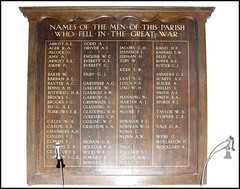 Look at the visitors book in any East Anglian village church; a large proportion of the names will be of people returning to the village that their ancestors left perhaps centuries ago. They always make for the church. This wasn't the case forty years ago. Fifthly, television and books have created a fascination with art and architecture that most people did not tap into before. Programmes about churches and castles have unbelievably large followings. People can tell you what a clerestory is and what a hammerbeam was for in a way that they couldn't in the past. It seemed to me that all these points needed to be taken into account when considering the future of redundant medieval churches. 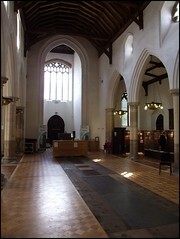 At the time I wrote that, the Ipswich Historic Churches Trust still seemed stuck in the 1980s, pursuing commercial solutions to the problem of finding new uses for its empty churches. But as a member of the IHCT committee confided in me, this is not going to happen; not at St Peter, and not at most of the other redundant churches. No business is going to pour cash into old buildings with poor service access, when there are now so few restrictions on building afresh on brownfield and even greenfield sites. I finished my 2006 polemic by stating what I firmly believed to be true: there would never be a commercial reuse for this building. 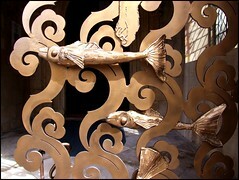 But I also believed that the future for St Peter, if it existed, had to be a sustainable one. I asked what could be done to make people actually want to go to St Peter, and to persuade us that it is worth paying for, through our taxes or even through our pockets? Even as I was typing that, plans were afoot to actually do something about St Peter. Now, I hope it doesn't sound too immodest of me to point out that my suggested future for the redundant nearby church of St Lawrence has come almost exactly true, so I am happy to report that here, at St Peter, the planners did not take me up on my suggestion of demolishing the nave and chancel. However, once it became clear that there was no possible commercial future for the building, people with energy started getting clever, and finding out about grant-funding and public sector finance. This was a sea-change in thinking, and an extremely important one, because today in England, only the public sector can afford to take on projects of this type. Here at St Peter, the church has been transformed into a concert space stewarded by the Ipswich Hospital Band, one of the best of its kind in the country. The transformation has been a gentle one. 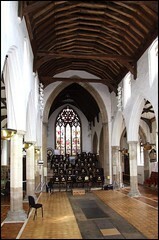 A raked stage has been built up within the chancel, the floor has been replaced, the walls have been decorated, and the stained glass restored. It is simply and pleasingly done, and cost a good deal less than the £1.2 million required at St Lawrence. The Ipswich Millennium Tapestries are on display, there is a local history exhibit, and the building is open regularly to visitors. At the turn of the Millennium, only one of the five churches had any sustainable future. Now, all five of them have a secure life ahead, and four of them are already in use - only St Clement waits to become the new Arts Centre for Ipswich. For anyone who knew these churches twenty years ago, it is a most heart-warming experience to visit them now.